For the average Internet user, their browser’s ‘user agent’ would not be a cause for consideration – many, in fact, may not know what the user agent refers to. 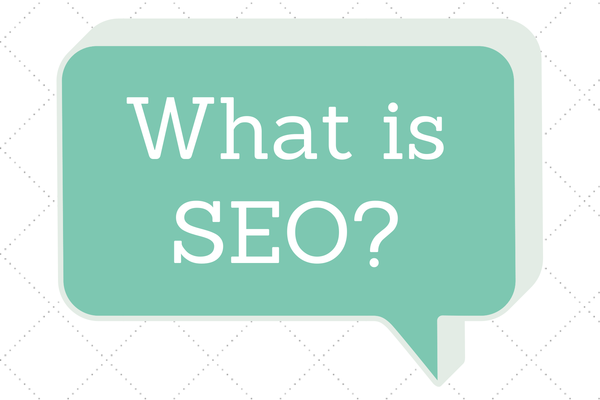 There are some more detailed descriptions available online; in brief, they are a web browser’s unique footprint. This means that a web developer can create a version of a website for use in Internet Explorer 6, given its infamous lack of compatibility with standards. User agents also work to help identify an incoming mobile browser, like Chrome on Android or Safari on iOS, resulting in the mobile site loading. All major Windows browsers can mask their user agents, making this a convenient way to reduce data consumption with limited bandwidth. One of the two options for Firefox users, Overrider is a restartless addon, meaning that it takes effect as soon as a page is refreshed, as seen in the above image of Google’s mobile results page. 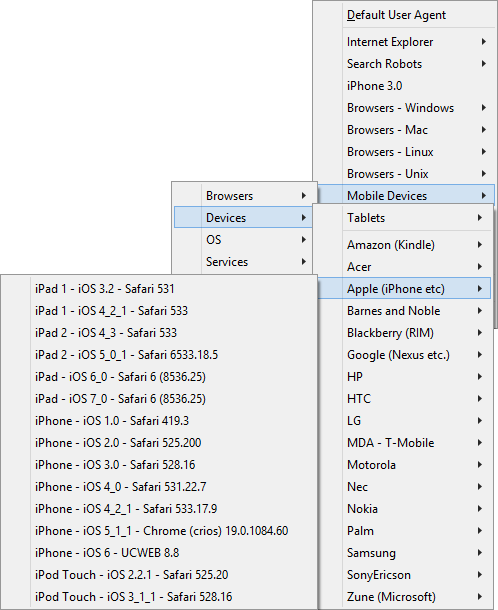 Options are kept to a minimum beyond a drop-down of available user agents that the browser can identify as and a window in which new user agents can be added. 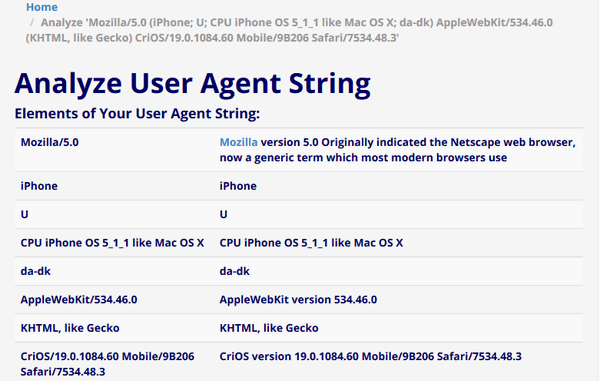 Nevertheless, this is more than sufficient, given that the user agent string correctly appears as an iOS device below. Overrider works well based on our testing, switching between mobile and desktop versions of sites with a single refresh. During our testing, we encountered only one issue: when masked as a desktop web browser, the YouTube player refuses to load it properly. When masked as an Android or iOS web browser, it works properly and switches to the mobile YouTube site as well. 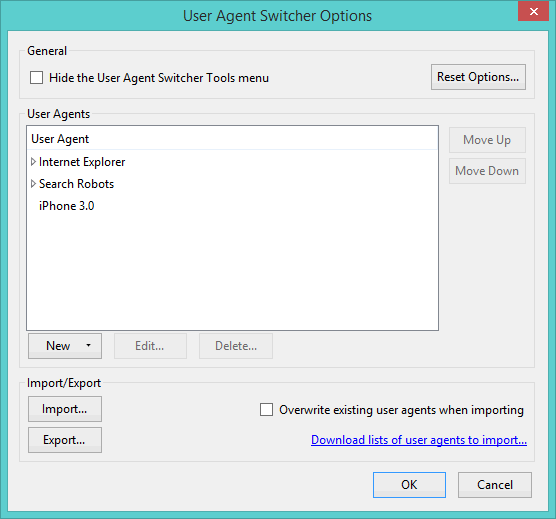 The older of the two Firefox addons, User Agent Switcher was last updated in 2011 though retains compatibility with the latest builds of Firefox (at the time of writing, 31.0). At first, we were concerned that it did not work, given that it provided no choices. 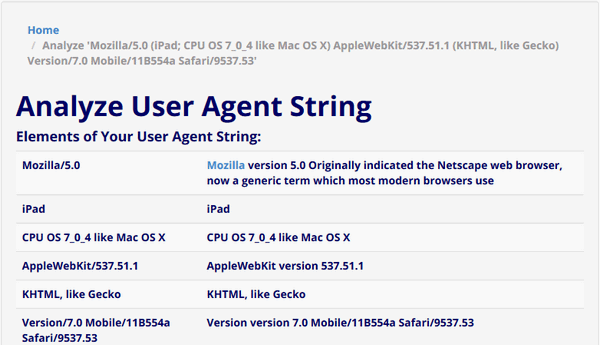 After some hunting, we were able to find an XML file containing a huge number of user agents. As the Settings window shows, there are a lot more options than in Overrider, including the ability to import these. 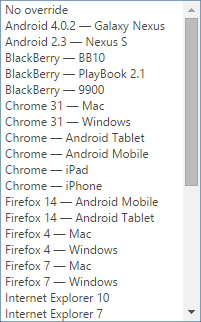 In truth, this is by far the most comprehensive list of user agents of any browser we examined. After importing the XML file, Switcher worked perfectly. It’s a little more involved than Overrider, but may be worth trying if only to be able to identify your browser as a device as dated as the Nokia N97 mobile phone, or as unusual as one of the spider bots that indexes websites. Interestingly, Switcher was able to play YouTube videos as well, rather than producing a seemingly-broken player window. So-called as a result of the F12 keyboard shortcut through which it is accessed, the ability to change user agent strings within the browser is a default element of Internet Explorer 11. There are a lot of options included in this window beyond the user string, including the resolution and screen size. 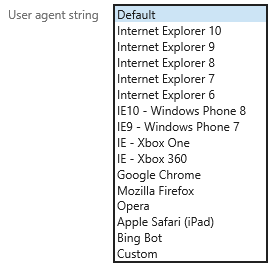 While hardly surprising, a lot of the user agent strings are Microsoft-owned properties, including the Xbox One and Xbox 360 consoles. Should you be an advanced user, IE11 includes the ability to add custom user strings, but seemingly not to import XML files. Masking the user agent string works properly, and sites were unable to identify the browser as Internet Explorer when we sought to have it appear as something else. YouTube videos functioned as normal during this testing. The developer tools found within Chrome, like those within Internet Explorer, are intended to make any extension unnecessary. Custom user agent strings can be added, though this should hardly come as a surprise given that the other two major web browsers on Windows allow the same to be accomplished, whether out-of-the-box or not. 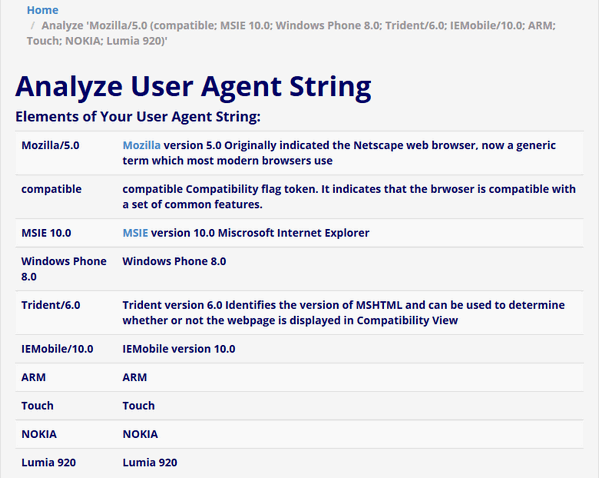 As with Internet Explorer, there is a clear bias in the default user strings available; they are primarily Google-owned devices. Chrome’s developer tools work as would be expected, allowing the browser to pass itself off as an antiquated version of Opera, from before the Presto rendering engine was abandoned. Access to Chrome’s user string options is not as straightforward as in Internet Explorer, requiring use of the “Ctrl + Shift + J” shortcut to work properly. Our experience with changing user strings in the three main Windows browsers has been very positive. All were able to properly mask themselves, loading the most appropriate version of any website tested. Though the growth in popularity of responsive web design could ultimately render switching between user agents of limited use, it is pleasing to see it remains widely supported. 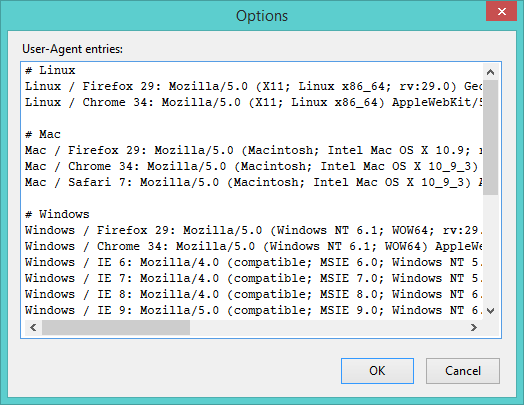 Rather surprising, however, is the fact Firefox cannot switch user agents without third-party extensions. The post How to Change the User Agents in Firefox, Chrome and IE appeared first on Make Tech Easier.